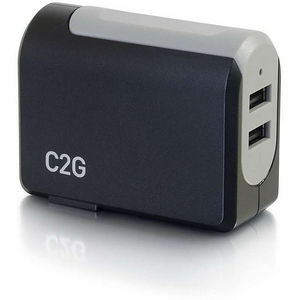 The 2-Port USB Wall Charger - AC to USB Adapter is an ideal solution for charging a mobile device at home, in the office, or on the road. This adapter features a compact design for easy portability, provides a power output of 5V and 4.8A for device charging. The compact design of this adapter makes it easy to toss into a suitcase or backpack for charging on the go. The AC prongs fold into the adapter for travel, lessening the likelihood of damage to those prongs. 5 volts and 4.8 amp (2.4 amp per port) of power are available for device charging from this adapter when it plugged into an AC outlet. The power output makes this adapter the perfect solution for charging smartphones and tablets.